Several months ago, I came across the book, Chart Sense by Rozlyn Linder, and I have decided that these resource books are a must have for every teacher of reading. They are books that you can flip through over and over again and find a new, fresh idea you can take and run with to the classroom. Dr. Roz gives lesson ideas to go with each chart, and nearly all of the charts are set up to be used over and over again to offer high student engagement, higher level thinking skills, visual modeling, written response opportunity, and frequent reference after. 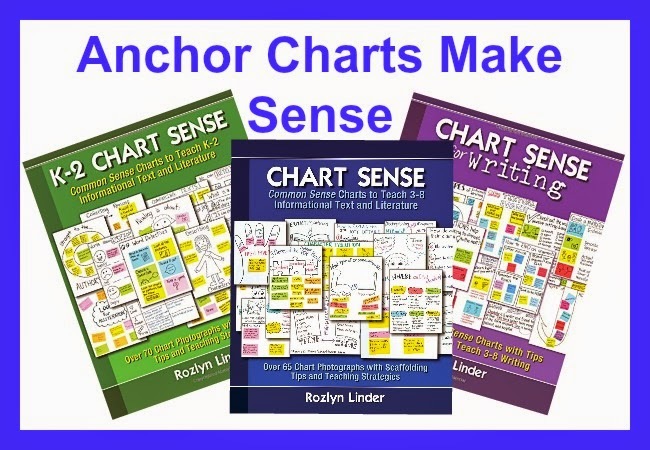 At the opening of all three books, Dr. Roz walks through the research related to anchor chart usage, and I think whether you're an anchor chart pro or an anchor chart beginner, the information is a great reminder as to why using anchor charts is a solid practice. Here is what Dr. Roz had to say. Students have a shared sense of ownership over the content. Kid love to see their handwriting on the charts they create. They quickly point out to visitors which part was "theirs" and love to admire their part of the whole. If a chart falls down, students quickly work to get it back up in the prominent location. Store purchased charts may look nice, but they are seldom used. When students build them, they are much more meaningful. They give visual reminders of what is expected, how to get there, and how to work it all out. They alleviate the need to ask questions which is especially helpful if a child is too shy to ask. They can pique interest in a topic when used as an activator. There are four basic types of charts that teachers use. They include charts for rituals, toolbox charts, classification charts, and interactive charts. Ritual charts are those that share routines for the class. They are typically created at the beginning of the year and remain posted throughout the year as class norms and routines. Classification charts are typically a little more interactive and can be used with multiple articles or books for practice. Sticky notes are used to gather information for the charts. Classification charts are used for genre studies, to compare/contrast books, to collect big ideas or important concepts about a topic, to form lists, to clarify misunderstandings, or to introduce new topics (brainstorming), and they work any time of year. Interactive charts are the last type, and guess what?? They are reusable. These charts include a framework, but students contribute the "meat" of the content. They are made in a collaborative fashion with the students while the teacher uses the "Think Aloud" process to help students deconstruct the text. 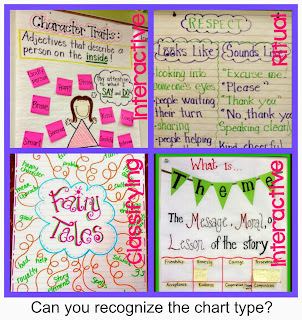 These charts provide exemplars and work with sticky notes of various sizes. The sticky notes can be removed to allow the chart to be used with other texts in other lessons too. From reading Dr. Roz's books, I have decided that not all charts are equal. Here is what I see as positive and negative. Do you agree?? 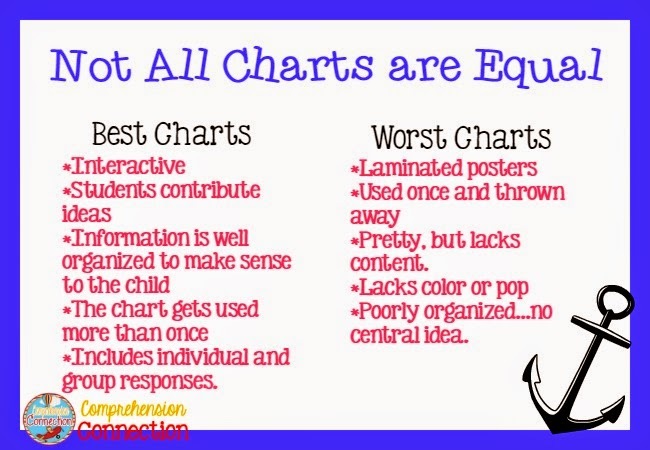 Do you find that using anchor charts is a little cumbersome? Well, never fail, there are ways to make it easier when space is limited and when the routine just doesn't lend itself well to lots of chart paper. If this applies to you, then you might give these great chart usage options a try. 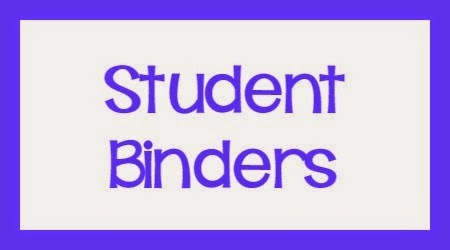 Student binders can hold smaller versions that are either photographs or prints of anchor charts made with the class. Teachers who are tech savvy might print the charts made with the group for students to keep in their binder for later use and reference. The advantage is that it take no wall space, but the negative is that in a book, students may not look back to find them. 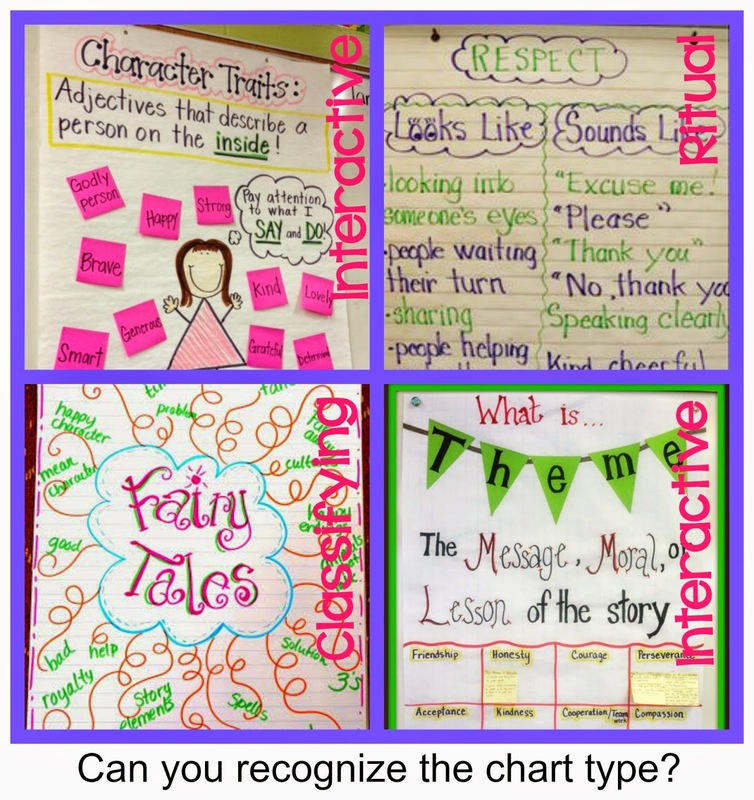 Teachers can photograph anchor charts created by their classes, print them, and place them in plastic sheets for students to refer to later on. This may save space and keep content organized, but access may be challenging. 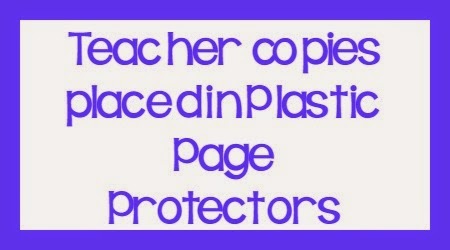 One positive is that the teacher can quickly grab them and copy them for students, and it would be helpful for planning. The third option is for the digital teacher. With Smart Notebook, teachers and students can work together to draw, label, and contribute to the construction of a chart. Teachers can print copies, and it this keeps the room clean. These can also be retrieved quickly. 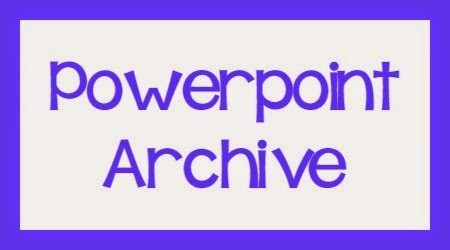 The last option is the Powerpoint Archive. Now this idea is appealing to me. 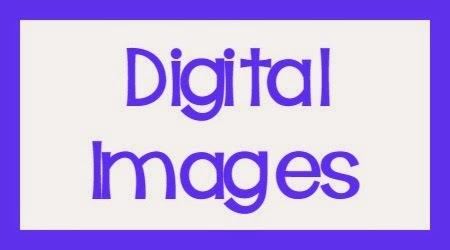 Teachers photograph the charts made and import the image into an ongoing Powerpoint file loaded to the school's Google Drive. I love this idea as students can access charts at home or at school. Our school is going Google, so this will is one way to create an electronic interactive notebook. To end this post, I thought I'd share a few of the charts I've used this year. Some of the ideas I found on Pinterest, and some were found in my Chart Sense books. 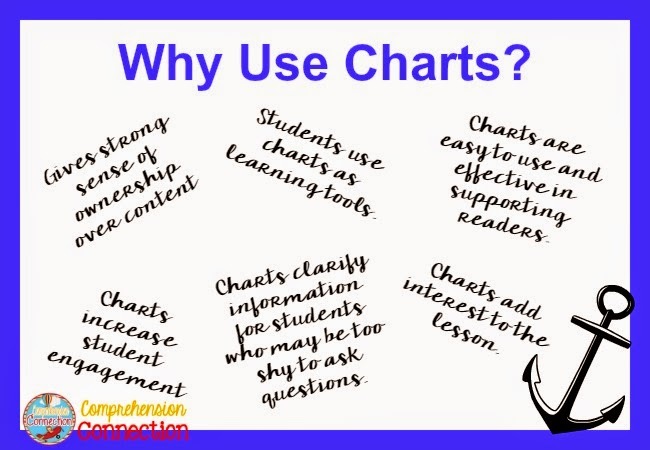 I have added quite a few to my Anchor Charts Pinterest board, so I will share the link at the end. I love, love, love these books, and certainly, I would put them on your order forms for next year. You won't be disappointed. I love them. A reader on my FB page suggested another by her I want to look at now. Maybe this summer.